When the Honda AX-1 was presented in November 1987 http://translate.google.de/translate?hl ... &sandbox=1 the power was said to be 29hp, whereas the a few months later announced NX250 only got 26 hp. An AX1 was thus the object of desire for quite a few NX owners and one of the reasons I bought myself an AX-1 in 2013 http://www.nx250.de/ax1.html. Since AX1 and NX250 both got MD21 engines it was long thought that the AX1 cams at least partly account for the power plus. But it turned out that they are exactly like the ones in my 1989 NX250. A second pair of AX-1 cams bought in Japan were also not different. 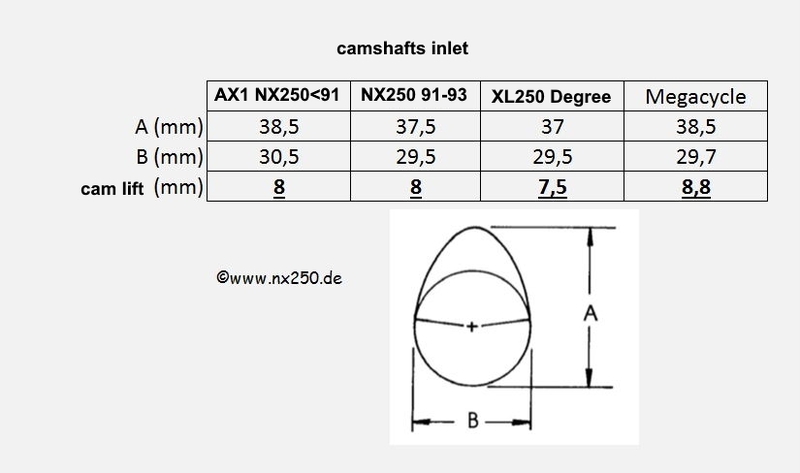 And while I was at it I also measured the cams of my XL250 degree http://www.nx250.de/xl250-degree.html. 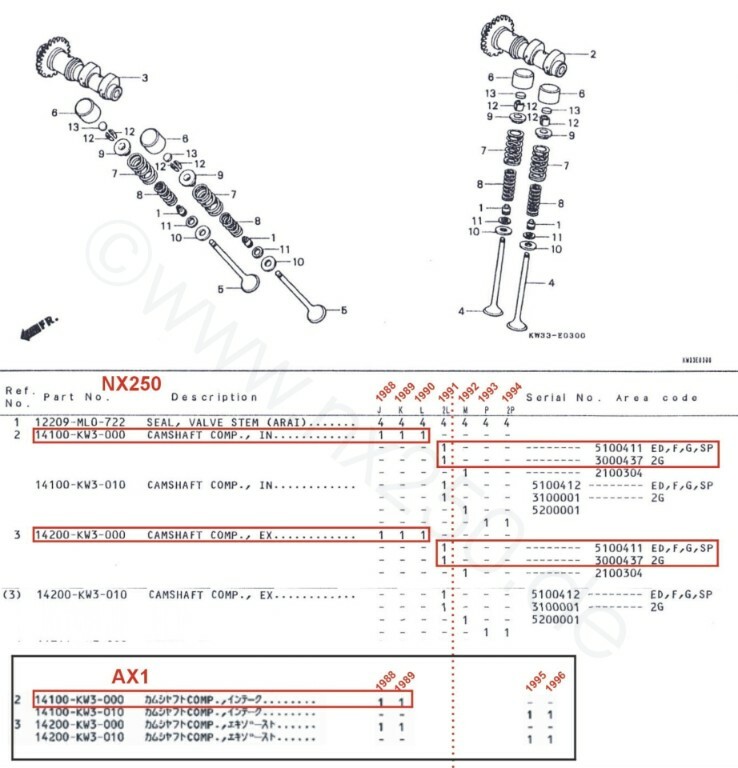 I finally got confirmation when I found Hondas official parts catalogue of both the AX1 and the NX250. 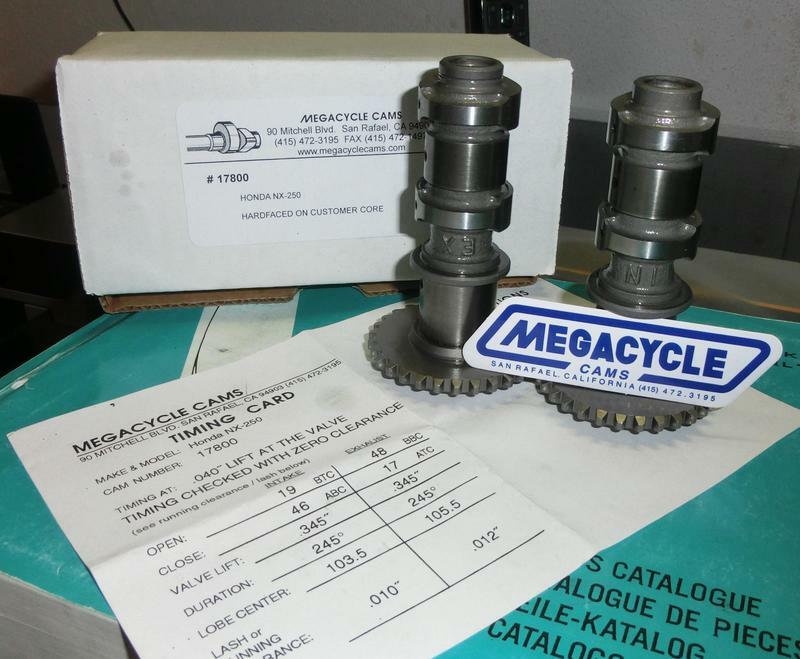 The inlet camshaft, for example, got the same part number (14100-KW3-000), meaning that the AX1 cams were also used in the NX250 up to 1991. Since the AX1 cams did not deliver more power I bought a pair of megacycle cams – not that easy of a task because they don’t deliver to Europe. 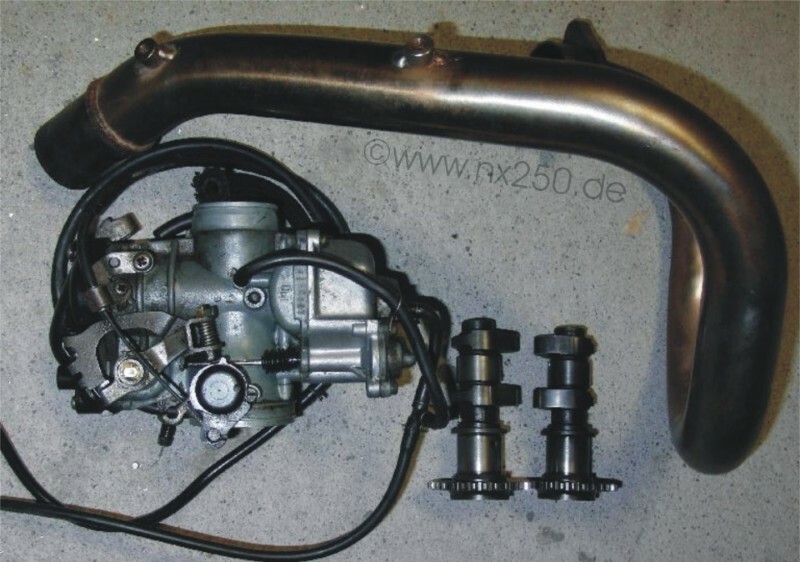 But back to the question of the AX1 power plus – the carb is the same and the manifold (though made of stainless steel) got the same diameter as the NX250 one – the only difference is the muffler, but I doubt that this might account for 3hp. So I guess the 29hp is just a myth – maybe Japanese horse power are just a bit less powerful than European – it’s the same with the NX650, it was announced in Japan with 48hp but arrived in Europe with 45hp.